I have oily hair that becomes very sticky and highly unmanageable in summer. Nevertheless, I always oil my hair at least once in a week and leave it overnight to shampoo it off the next day. Coconut oil is my first choice for a scalp massage. But in summers I would rather use herbal oils such as amla oil, curry leaves oil, Aloe-oil or hibiscus oil which I prepare at home– all these oils, however, have coconut oil as the base. These oils are very cooling and applying these before going to bed gives me an undisturbed and peaceful slumber at night. I haven’t tried using too many commercially available herbal hair oils partly because I don’t want to end up losing hair by experimenting with unknown products. But when my friend who has thick, luxurious hair told me how after using Dabur Vatika hair oil, her hair got a visible shine and helped her to deal with long term hair-fall and dandruff, I decided to give it a try. I’ve never had any dandruff problems but excessive hair-fall does bother me sometimes, and since I didn’t have the time to prepare a herbal oil at home, I purchased a bottle of Dabur Vatika. What especially drew me to this product was the fact that that it has the goodness of the hair-friendly herb Amla in it. It is a unique formulation of pure coconut oil enriched with special hair care herbs like henna, amla and lemon. Coconut oil, the main ingredient of this herbal hair oil is one of the best oils on earth; it nourishes and protects the hair. Henna is supposed to help with premature graying and Amla strengthens the roots and prevents excessive hair-loss while the astringent action of lemon controls sebum flow to fight obstinate dandruff. In addition, this hair oil is also enriched with the goodness of Brahmi (Centella Asiatica), Harar and Rosemary. I have used it for over a month, twice a week. It’s not very heavy or sticky like other oils; it has a pleasing aroma of herbs which is not too overpowering. I massage this oil into my scalp gently with my fingers, not forgetting to apply it to the ends as well. I leave it overnight to work on my hair. And the very next morning I wash my hair. I have found that my hair doesn’t become dry and lifeless after the ‘head-bath’ and these days my hair has become quite soft, shiny and silky, but then even an application of pure, extra virgin coconut oil gives similar results. However, I didn’t experience any substantial hair-fall during this period. Overall it seems okay to me. As it has no harmful ingredients and chemicals I think it might suit other hair-types as well. First time reading your blog, and I must say, it's really good! Anyway, I'm glad you did an article about Vatika Coconut Hair Oil. I swear by this stuff--plus it doesn't smell as vile as other coconut oils do. I’m impressed with this product. yep i agree with you guys,i have very bad dry hair,and also suffer with flaky scalp,this oil is very pleasent in smell,unlikely other hair oils,it also leaves my hair really nice and soft after shampooing.its great stuff! Thanks for the review on this product. true that dabur vatika oil put back the healthy shine and bounce to hair. Hope this works great. Have to say my hair has grown noticeably faster since using this product, even my hairdresser asked what had happened as is usually grows about 1mm a month!! I bought dabar vatika and have been using it for a couple of weeks now. I have to say that my hair does feel quite a bit longer, I had it cut onto a bob about a month ago and it’s already grown over an inch. ! I love this stuff. Ive been buying mine at an indian store and the price and delivery have been wonderful! Umm...I am obsessed with this stuff. My hair is chemically processed, so sometimes I have issues with dryness, especially at my ends. I put a water based moisturizer, which helps, but then it wears off and my hair is dry again. So I started putting the Vatika Oil on over the moisturizer, and my hair always feels moist and soft now. And the shine, softness, and smoothness it gives me is incredible!! I use it at night, and throughout the day as needed. I wish I could marry this stuff, true story. Earlier i had hair fall and i was loosing my confidence also .. once started using Dabar Vatika Hair oil and Dabar Vatica shampoo my hair fall has stopped and now i wont have hair fall problem at all. It's good product to use since no side effects because Dabar Vatica made up of natural ingredients. Thanks to Dabar producing such a good products. All you need to do is apply it at night onto your hair and do it consistently and then watch your hair grow! where can I but vatika oil? I live in Maryland, and I have no idea where to get it. Anonymous (comment #11): I have no idea where it's available in Maryland. Why don't you buy it from amazon? This oil is soo effective as a deep conditioner. I had noticed my hair was thinning at the temples and near the front (from too much hair pulling). After using it for only 3-4 weeks I am seeing new growth. Available for $4.00 at Lakshmi's Cupboard. Healthier and shinier hair is also one of the Virgin coconut oil benefits. To keep your hair from being dry and unmanageable, spread an ample amount of coco oil from the roots to the tip of damp hair. Do not put too much or your hair might get greasy. 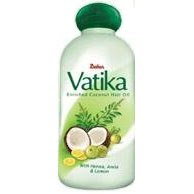 Vatika is a herbal oil for providing nourishment to the scalp and hair. Vatika is made from a base of oil from hand picked coconuts and several vital herbs like triphala, kapurkachari, neem, brahmi, lemon, rosemary, henna and milk. The herbs provide nourishment to the hair by preventing hair damage. Clear yellow colored oil, having a unique fragrance, packed in 150 ml and 300 ml containers. Herbs provide nourishment, prevent overall hair damage. Vatika is cool hair oil; replenishes hair from the root. Only drawback is the smell which is not very juicy. So try the odor before you give it a try. Some Indian hair oils can be very sticky in use. But Vatika is not at all stick. It gives the hair a shiny look. I recommend Vatika for weekend uses. Coconut extract is good for hair; so giving your hairs a coconut treat once in week is healthy by all means. I'm so glad you did a review of this! I used this oil before but caused me massive amounts of hair fall however I did have dandruff at that time may be why I had lots of hair fall. My hair use to be very thick and heavy, its now think but it is long however doesn't look like the way it was 3 years ago. My hair is dry, fizzy from the ends at the bottom and is dull, miss my old hair I don't even use any styling products or even straighten my hair at all. Should I use this oil again or not? If this oil doesn't suit you, please do not use it again. Instead you can try plain coconut oil.